To combat this cycle of wetness, I make a “winter sandwich” on top of my hives. The picture below shows a vented super above my hive bodies. I'll plug and open the vent holes throughout the winter to try and manage the temperature and moisture inside the hives. Of the eight vents, I almost always keep seven of them plugged with rubber stoppers. The eighth vent I leave open on front of the hive—this is to discourage any air flow from crossing over the cluster while still venting moist air before it can condense. The vented super also gives me space to put fondant for winter feeding. Above the vented super is the inner cover, which provides a top entrance in case the bottom entrance gets obstructed. Then comes a moisture board and a piece of foam insulation. 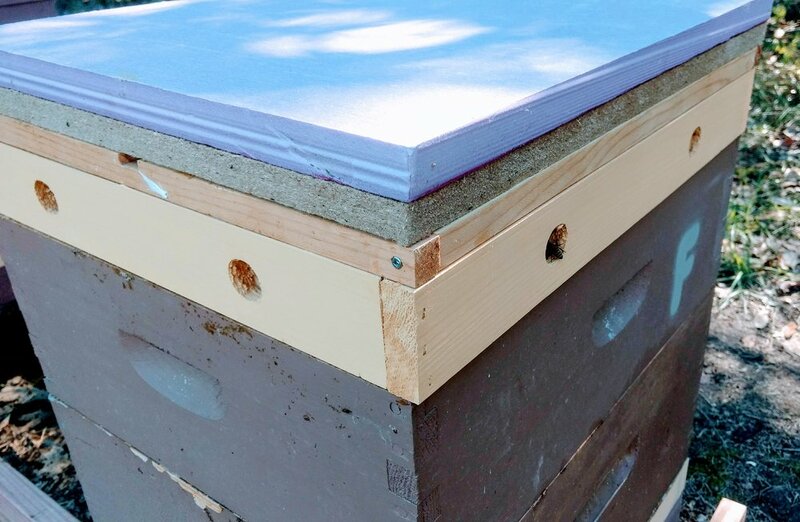 The insulation is meant to keep the inner cover warmer than the outer walls of the hive, thereby directing any condensation to the walls where the bees can use it for water without it posing a significant threat to the cluster.